…but I’ve written more words in the the last nine days than I’ve written in months. As far as I’m concerned, that makes me a winner whether or not I reach 50K. If you don’t hit 50K, at least you’ll get a Certification of Participation, right? 😊Not as such, no, but my efforts will be recorded on the NaNoWriMo website for posterity… and will add to my lifetime word count. 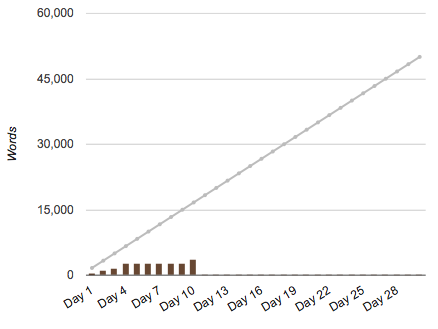 Previous Previous post: NaNoWriMo Begins! Next Next post: 2/3 of the time gone… and 1/5 of the words written. Sigh.